This tourism object is located at Jatiarjo village Prigen distric. 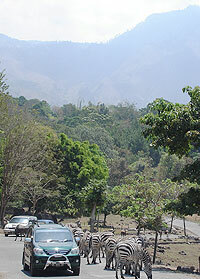 This natural preserve is the branch of Cisarua - Bogor natural preserve. As the natural wild life, preserve Taman Safari Indonesia collects various wild animals. This wildlife preserve is 295 hectares, the wild animal such as : lion tiger, wild buffalo, komodo, rhinaceros, bison that live in open area. Lies at the slope of Mt. Arjuno 800 – 1.500-meter sea level cover 340 ha and divided three zones. Wild life zone, place for visitor observing a natural wild life. Attraction zone for performing education through entertainment attractions. 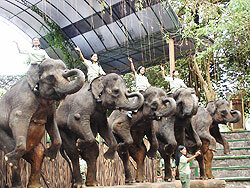 Each Sunday we can see that circus of Taman Safari Indonesia Jl. Prigen. Baby zoo zone place for visitor to getting photos and closing to the baby animals. Taman Safari surrounded by the beautiful panorama and fresh atmosphere with temperature 24-25o C, it also has supporting facilities such as; recreational park for children. There are dozens of rides and games designed to be fun for people of all ages. Elephants, Camels, Ponies and Ilama are always exciting for children. Don't forget to visit the restaurant and souvenir shops to relive the adventure.This location is also easy to be reached. It take only 1 hours from Surabaya or Malang. Visit Taman Safari Indonesia II with your family, friends or the other. Here you can meet with the youngest animals. You also can take a picture with young Orang Utans, white and the endangered Sumatran tigers, African Lion. Watch and learn the Orang Utans, Chimpanzee, Proboscis Monkeys and more as they swing from branch to branch in their unique cultural settings as well as Cheetah, the fastest land animal in the world. See also our variety of attractive birds in our walk in aviary. Then it's time to go to through the reptile house and see all kind of snakes, lizards, and nocturnal creatures from all over the Indonesian. The adventurous will enjoy the Safari walk that wonders through the Mount Arjuno and at the camping ground area. Trained guides will accompany your trip. Fresh air and character building activities abound in the bound area adjoining the park. Rope climbing and flying fox are fust a few of the exciting activities in this area.